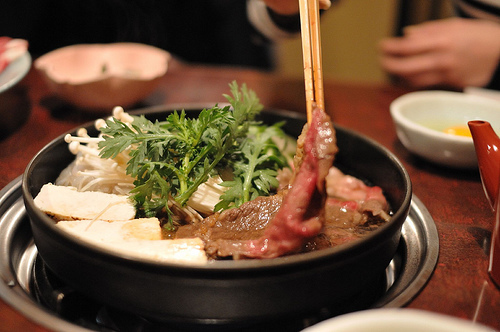 Are you familiar with sukiyaki? It is a Japanese dish consisting of thin slices of beef cooked with various vegetables and soy sauce based mixture in a table-top cast-iron pan, and usually eaten with raw beaten eggs. There is song called Sukiyaki although it is nothing about the food. Anyway, it is very popular Japanese dish so you may have heard of it. Cooking sukiyaki is simple, but the mixture called warishita is kind of trouble to make; you have to measure and mix soy sauce, mirin, dashi stock, sugar, and sake. Well, there is a super easy and simple way to make the mixture using only COKE and soy sauce! Cook 1/2 lb of thin-sliced beef in a deep pan and put whatever vegetable and ingredients you want like green onion, tofu (cut into cubes), shitake mushroom, Chinese cabbage, and jelly-noodle, and then pour 1 cup of coke and 1/2 cup of water in the pan. Put a lid on and simmer till all the ingredients get cooked. Lastly, add some soy sauce to taste. Serve with steamed rice! When you use coke, pick a regular coke because diet coke won’t work. This way, you don’t have to buy mirin, dashi or sake, which might be expensive in other countries.